If you receive an 80040154 error like below when connecting to QuickBooks, it's possible that something has undone your QuickBooks COM registrations (like installing a previous version of QuickBooks or other software). You can try downloading registerall.zip and please extract zip file & run RegisterAllQBDLL.exe. 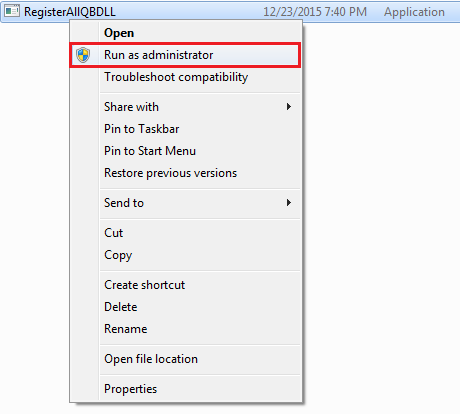 Right click on RegisterAllQBDLL.exe & click "Run as administrator"
It will take some time to run. After completion of the run, you will get the popup message. Please click on OK button to close the message box. 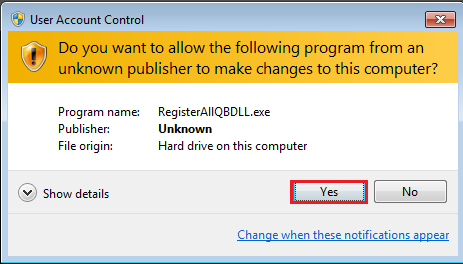 By running the RegisterAllQBDLL.exe contained in the zip file. This will re-register all the COM.DLLs in the QuickBooks directory for you. Once that's done, retry connecting. If that doesn't work, you can try running the "reboot.bat" file in the file in the C:\Program Files\Intuit\QuickBooks Premier folder. Just locate the file in Windows Explorer and double-click on it to execute it. This will reset the all the QuickBooks COM objects. Finally, if that doesn't help try re-installing QuickBooks, this should have even the most difficult installations going.